Are you looking for a Sweet Career Opportunity? Are you a Sales professional looking for something a little more exciting? Want to work in an environment where we’re not afraid to have a little fun…okay, a LOT of fun? 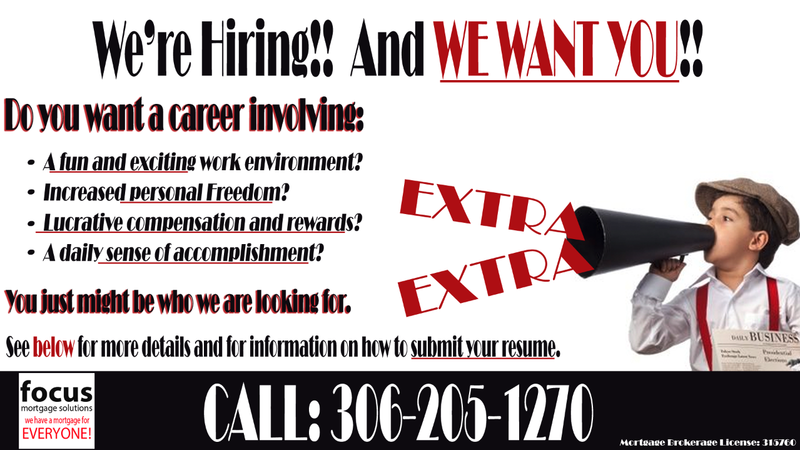 You may be what we are looking for! FOCUS Mortgage Solutions is expanding their Regina team and WE WANT YOU! We are looking for highly motivated Sales people with a proven track record to join us as we head in to yet another Record Breaking Year! Our compensation structure is built to make YOU More Money…and let’s face it – everyone enjoys making money. The more you do – the more you get paid! If you are interested in a long-term career with lucrative rewards – then send us your resume. We provide one-on-one training and work with you to create effective marketing plans to grow your business and to help you achieve success faster! FOCUS Mortgage Solutions is one of Regina’s leading mortgage brokerages with an exceptional and loyal customer base. With housing prices on the rise and an increasing demand for low cost mortgages – the timing is perfect for anyone looking to develop a career as a Mortgage Professional. Got questions? Call 306-205-1270 for more information.